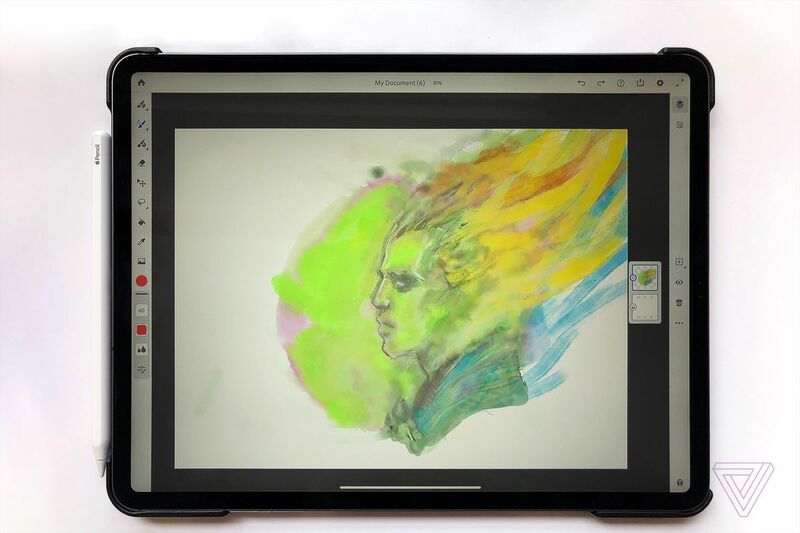 Adobe first teased Project Gemini, its “next-generation drawing and painting app” last October, along with a preview of its Photoshop for the iPad app. A beta version of the app is now being released to a handful of artists on a prerelease program, and it was previewed at the MoCCA Arts Festival in New York, where I got to take a look. While Adobe has said that Photoshop for the iPad will have features that focus on compositing workflows, Project Gemini is specifically focused on illustrating, painting, and drawing. The app’s main selling point is its Live Brushes, which are watercolor and oil paint brushes that behave like paint in real life. The brushes react to the paint that’s already on the canvas, so watercolors bloom and spread naturally, and colors blend together seamlessly. With oil paints, brush strokes are depicted with vivid texture, and you can even control how much paint can be applied on the canvas. Oil painting with Live Brushes. Project Gemini lets artists draw with raster and vector brushes, combining the tools from iPad apps like Adobe Illustrator Draw and Photoshop Sketch into one app. Vector brushes are scalable to any size, and you can import Photoshop brushes from your own library, which means you can load up tools like Kyle T. Webster’s custom Photoshop brushes. There are also some new features that were sorely needed in Photoshop Sketch, like a selection tool and the ability to add or subtract to the selection as well. Project Gemini’s UI is almost identical to Photoshop for the iPad, with the tool palette on the left and layer properties to the right. For someone like me who’s more comfortable working on a desktop than an iPad, that’s an advantage. I can work with the tools I’m used to and import the file as a PSD to continue working on it on the desktop. Adobe says Project Gemini is coming first to the iPad, followed by Windows 10 and Android devices. Both Project Gemini and Photoshop for the iPad are slated for release sometime in 2019. There’s no pricing information yet, but Creative Cloud subscribers can expect to use the apps as part of their membership.